For most Falls Church residents, it’s just another humid mid-Spring day. But for 40-year resident Andy Parks, it’s special. He’s sitting on his porch enjoying the spring rain with his dog Summer for the first time since last August. It’s a moment made possible by F.H. 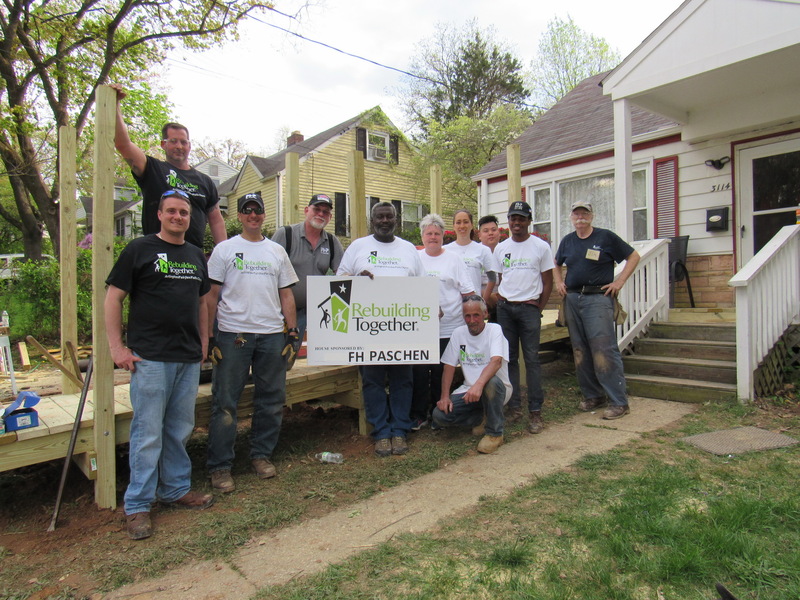 Paschen staff volunteering with Rebuilding Together on Saturday, April 28. “You couldn’t put a price tag on that day,” Senior Estimator Anthony Edwards explained. Before that weekend, Andy lived mostly confined to the home he shares with his wife Kitty. It’s not that Andy didn’t want to leave; he physically couldn’t on his own. Andy had double-knee replacement surgery closely followed by other health problems, and is now confined to a wheelchair. 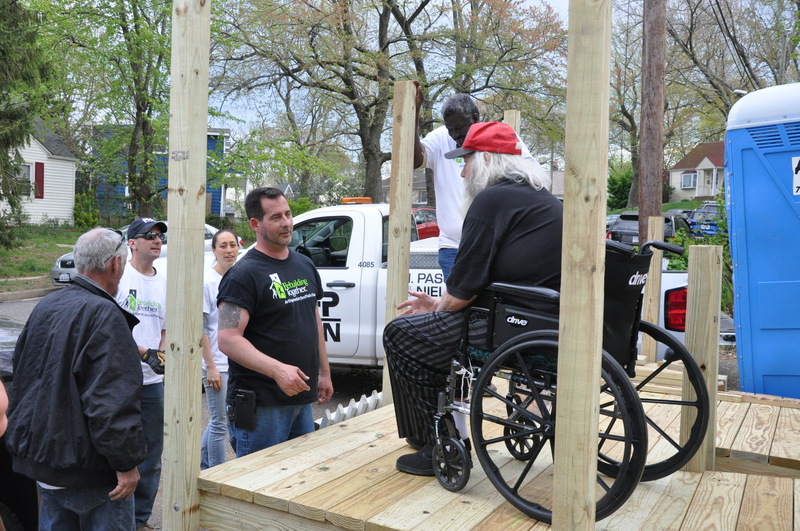 Without an access ramp, the wheelchair made getting out of the house a major obstacle. He could only leave his house to attend doctor appointments, but even those outings posed a problem since couldn’t get out of the house without assistance. The local fire department had to be called for each appointment to help Andy out of the house and down the porch. Noticing the urgent need, Andy’s physical therapist referred him to the local chapter of Rebuilding Together. 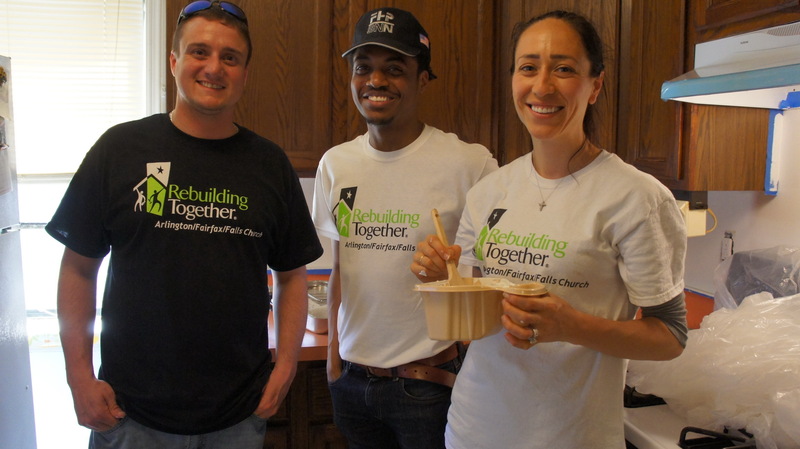 Rebuilding Together, Inc. is a national non-profit organization that focuses on safe and healthy housing solutions by connecting low-income homeowners with volunteers who can help. 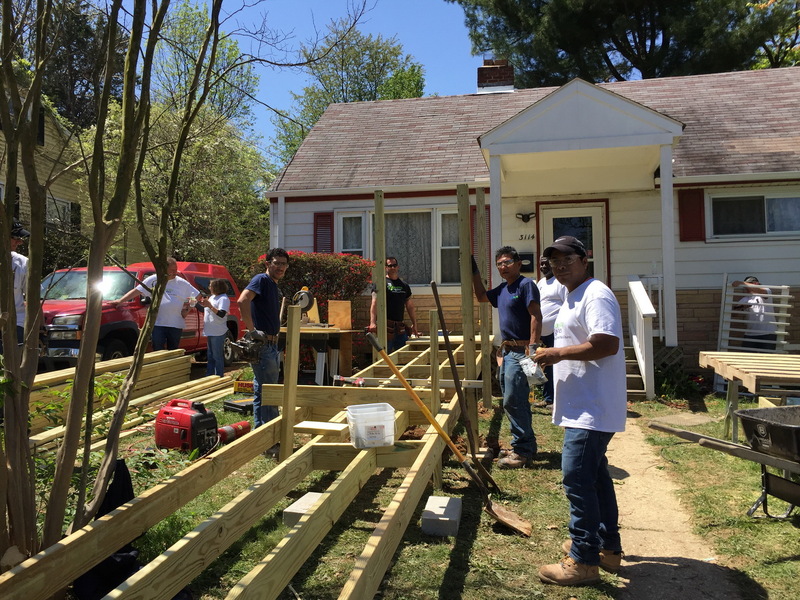 Over a two-day period, Paschen staff volunteered nearly 20 hours, and using their construction expertise, built a ramp from the front door to the driveway. In addition to the much-needed ramp, Paschen staff, with help of other volunteers, made many other interior and exterior improvements to the home. The crew completed tasks including repairs to the kitchen range hood, installing a fire extinguisher, cleaning the gutters, and fixing the backyard fence. When asked how his life has changed, since the ramp installation, Andy quickly replied with a smile, “I can get outside now.” If gratitude could be personified, it just might look like a man on his porch relishing the rain with his dog.